← One more STUPID thing done by evo! sport medals with the shape of coca?! 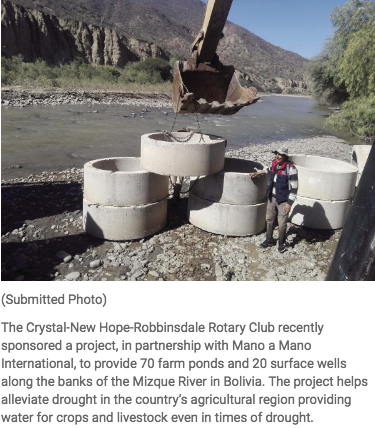 The Crystal-New Hope-Robbinsdale Rotary Club recently made a financial contribution to Mano a Mano International for the construction of farm ponds along the Mizque River in the Omereque region of Bolivia. The Omereque area is a mountainous, agricultural region which sometimes experiences severe drought — a situation which can be crippling for many subsistence farm families. 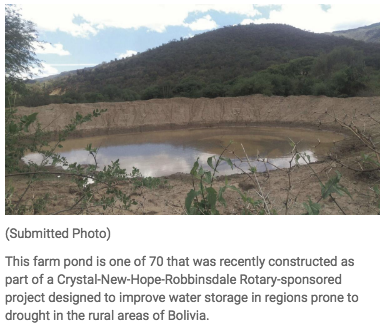 Jim Benshoof, a Crystal resident and director of international service for the club, said local officials in Bolivia requested help from the Mano a Mano International organization to help alleviate the problem through the construction of farm ponds and surface wells along the river’s edge. Mano a Mano has offices in St. Paul and in Cochabamba, Bolivia. The organization was started by a couple who had a passion for helping impoverished people living in rural areas of their home country of Bolivia. Benshoof said, the club first established a connection with Mano a Mano a few years ago. The two organizations first partnered to bring medical supplies to the country through grant funding. It was through that partnership that Benshoof learned of the need for improved water storage in the Omereque area, so the club sponsored the project and began raising funds. A group of rotary clubs and Mano a Mano International raised $23,000 for the project that completed 70 farm ponds and 20 surface wells. This project included support from the Minnetonka, Brooklyn Park, St.Paul, Detroit Lakes Breakfast, and Bismarck Far West Rotary Clubs. To learn more about Mano a Mano, visit manoamano.org. To learn more or to become a member of the Crystal-New Hope-Robbinsdale Rotary Club, visit cnhr-rotary.org. Follow the Sun Post on Facebook at facebook/mnsunpost. This entry was posted in Bolivia, Cochabamba, Health and tagged Health, sustainable development, water. Bookmark the permalink.